Shaft has a Drive Saver and there is a new Vetus flexible coupling which has not been installed. Spare fixed 3 blade prop. Both primary winches and one coach roof winch are electric. HeadsaIl is on a an electric furler with foot switches. 240 volt, 11 batteries charged by: engine, shore power, generator VICTRON Energy Phoenix 12 v / 2500 w Inverter / Charger. VICTRON Energy BMV-700 battery monitor. 12 and 24 v systems . Batteries: 12 volt house bank is 4 x 90 A MASTERVOLT AGM, 12 v engine start battery is a 70 A maintenance free, 24 volt electric winch batteries are 2 x 70 A maintenance free, bow thruster and electric furler batteries are 4 x 70 A gel batteries (new 2017) SUPERWIND wind generator c/w regulator and stop switch. ECHOTEC 70 lph watermaker. ONAN 7KW generator with 850 original hours. There is a Tri Star 60A MPPT solar regulator and cabling in place but currently no Solar Panels. She can be configured as either a 3 double cabin set up, or by removing a partition between the aft cabins, as a two stateroom configuration with a huge aft double cabin having his and hers heads. One sea-water cooled fridge-freezer & one air cooled fridge. A very clean and well presented Jeanneau 54 DS with under 2000 Hours on her equally clean Yanmar diesel engine. She is a fast, spacious and comfortable boat, easily single or short handed with her all furling rig, electric winches and bow thruster. Teak side decks could do with replacing, or better still for the tropics, removing and she is due for antifouling, but other than that she looks to be in great shape, well equipped and ready to go. 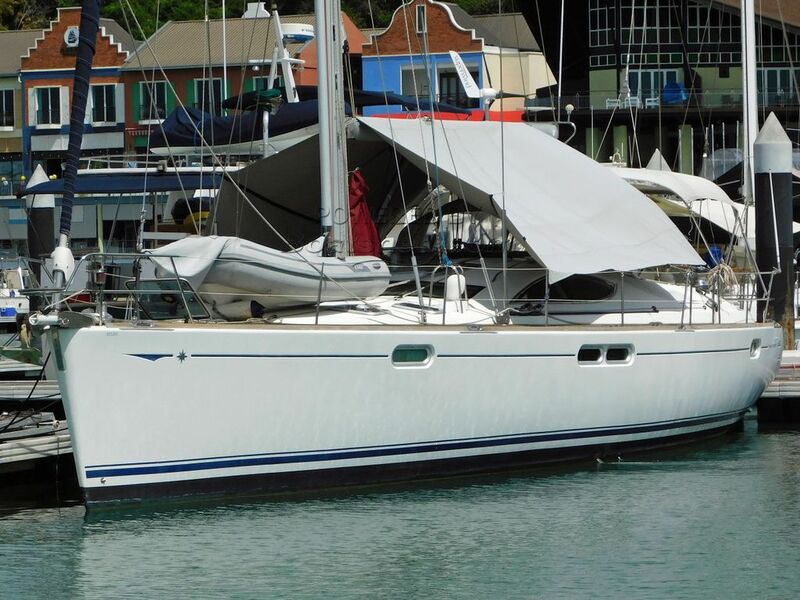 This Jeanneau 54 DS Deck Saloon has been personally photographed and viewed by Alan Giles of Boatshed Phuket. Click here for contact details.